To most everyone, the 2010 Breeders’ Cup Classic was a punch in the gut, the end of a magical run that brought an eerie hush to the crowd at Churchill Downs. Even after four years, many still find it difficult to watch Zenyatta’s spectacular run from last fall a head short of catching a courageous Blame. Unfortunately, this Classic will always be remembered as the race Zenyatta lost and not the race Blame won. And that is sad. The emotions following the race seemed to jump uncontrollably from pride and admiration to utter despair. 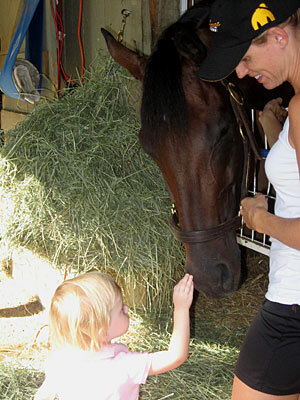 Going into the race, Zenyatta had become so much more than a racehorse to her vast legion of worshippers, who looked upon the magnificent mare as a powerful force in their lives, some even seeking an audience with her at her Hollywood Park barn as a cathartic experience to heal them, both spiritually and physically. No horse had ever affected so many people in this way, and to witness her losing for the first time in her life brought a stunned silence from some and tears from others. A misguided few even resented Blame for defeating the Queen. When the horses returned, it was a feeling unlike anything I had ever experienced before at a racetrack, listening to the loud ovation that rained down for the vanquished Zenyatta, while several yards up the track, the victorious Blame, a magnificent horse in his own right, walked into the winner’s circle in dead silence. Not even the pleading from jockey Garrett Gomez, who kept waving his arms at the crowd to acknowledge his horse, could evoke a cheer. The roller coaster of emotions began when Zenyatta made her usual auspicious entrance, walking past the stands with that unique “dance” step that set her apart from other horses. Before anyone knew what hit them, the race was off and Zenyatta immediately retreated so far off the pace many feared something was wrong with her, as she continued to lose touch with the field, trailing by some 20 lengths. She had fallen 10 lengths behind the next-to-last horse and looked to be out of the race. But then she began her move, weaving her way between horses, making up ground at an amazing rate. The crowd was now re-energized by the power of Zenyatta and they let out with a deafening roar. Mike Smith had to avoid a tiring Quality Road, which might have cost her valuable momentum. Finally he made his way to the outside and Zenyatta, as she had done in the previous year’s Classic, began gobbling up ground with those gargantuan strides. This was it – a miracle finish and a 20-race unbeaten streak. But the gutsy Blame dug in and fought back. Zenyatta kept coming, but her big move fell just short. The fairy tale ending that was to provide a fitting conclusion to the Zenyatta legend had been ripped out, as were the hearts of her fans. It has been four years since that gut-wrenching, emotionally draining Breeders’ Cup Classic, and Zenyatta is now a broodmare at Lane’s End Farm, producing several foals, while Blame has emerged as a hot young stallion on the racetrack and at the sales. He, along with War Front and a few other young stallions have helped catapult Claiborne Farm back into national prominence and a home to some of the nation’s leading stallions. The future of Claiborne not only rides on the back of Blame and War Front, but also on Kentucky Derby winner Orb and the ill-fated, but immensely talented Algorithms, just to name a few. But as we look back at the 2010 Breeders’ Cup Classic, there is still a touch of sadness. Not only the sadness of Zenyatta’s first defeat and the effect it had on so many people, but also the sadness in knowing that Blame’s career on the racetrack will be defined mostly by who he beat and not who he was. Most people do not know the real Blame, nor do they know how talented a horse he really was. Having been involved with horseracing for 47 years and having been close to most of the greats during that period I have to say that Blame was one of the kindest, most intelligent horses I have ever had the pleasure to be around. Looking at those big bright eyes and that slight dish face still brings a smile to my face. But on the racetrack he was a warrior, demonstrating his tenacity and will to win in his victories in the grade I Whitney and Stephen Foster Handicaps, as well as the Breeders’ Cup Classic. One of my fondest moments of that 2010 Classic was watching Blame being led through the darkness early one morning to the Equine Hydrotherapy Spa several yards from trainer Al Stall's barn, where he stood for about 15 minutes, as a bubbling mixture of 32-degree water, dissolved salts, and oxygen massaged the ankles, shins, and knees that would soon have to propel him in his quest to take down the mighty Zenyatta. Even co-owners Adele Dilschneider and Claiborne Farm’s Dell Hancock were out in the dark to see Blame work. Perhaps Dilscchneider’s most significant contribution to the partnership was elbowing Seth Hancock in the ribs at the 1996 Keeneland July yearling sale in an attempt to get him to up his bid to $710,000 for a yearling by Kris S., out of the Danzig mare Aurora, later to be named Arch, who would sire numerous stakes winners, including Blame. Dilschneider’s grandfather was the prominent Thoroughbred owner John M. Olin, who won the 100th Kentucky Derby with Cannonade. What made the entire experience even more special was having a horse like Blame, who has endeared himself to everyone who has ever worked with him. “He was always such a lovely horse to be around,” said Jane Dunne, who broke the colt. “You wish they were all like him. When I was at the yearling sale with Adele, I took her to see Blame, and here is this little lady standing right next to this big stud horse, hugging him and feeding him carrots and peppermints. So, on its 100th anniversary, with the ghosts of Arthur B. Hancock and Arthur B. “Bull” Hancock Jr. looking down, Claiborne Farm, like it had done for so many years, once again epitomized the rich and colorful tradition of Kentucky’s Bluegrass. That is why Bull’s son Seth stood on the racetrack motionless and speechless following the Classic, oblivious to the almost-eerie hush that had engulfed Churchill Downs and the ensuing rousing ovation for Zenyatta upon her return. Hancock could only come up with one word to express his emotions: “Indescribable. Indescribable.” Even then, the quaver in his voice made that one word difficult to get out, as he stared off in the distance, as if transfixed by the storied chapter he and Dilschneider, Al Stall Jr., and, of course, Blame had just added to the Claiborne legacy. “Just like the Derby gods, it’s almost like it was meant to be,” Hancock said. Hancock, however, said recently that Blame “is the most under appreciated horse we’ve had in some time.” And he’s right. 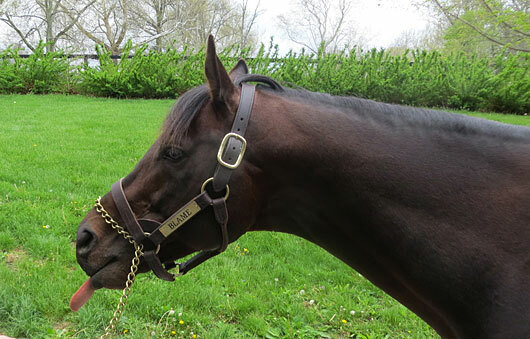 It was because of the feelings and the affection I have for Blame as a racehorse that I decided to go visit the stallion at Claiborne the day before this year’s Kentucky Derby. He was still the same old Blame; a joy to be around, with those same gentle eyes and kind disposition. What is really sad is that after the Classic there were actual physical threats directed at the horse, and Hancock received letters, many of them filled with nasty language. Claiborne’s booking secretary Melissa Grucza believes if Blame had been voted Horse of the Year they wouldn’t have been surprised if someone had come to the farm to try to do harm to the horse. That is how disturbing the Breeders’ Cup aftermath became. 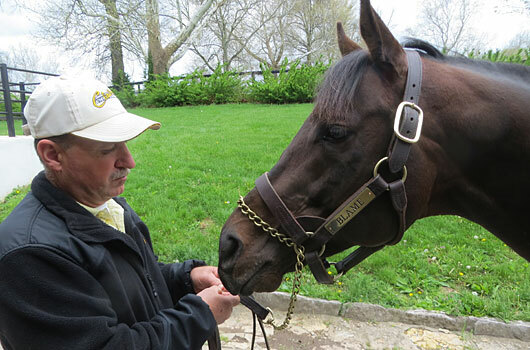 For those at Claiborne who had tremendous affection for Blame and felt so much joy being around him, and for him to be a major part of the farm’s 100th anniversary, it had to be difficult to endure. Peel met me in the office and took me out to see Blame, but not before I was given a handful of mints by Grucza to feed to the horse. “He loves his mints,” she said. It was like seeing an old friend. His coat looked terrific and he was as personable and easy-going as ever, even as a stallion. 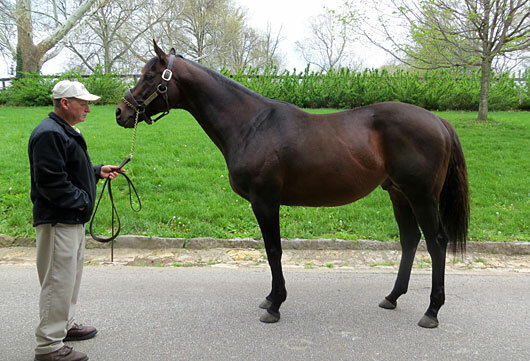 Peel said Blame was bred to 104 mares his first year, 108 his second year, and was estimated at 110 this year. Blame has already demonstrated his versatility in his first crop, with his offspring breaking their maidens at Santa Anita, Monmouth Park, Gulfstream Park West, Arlington Park, and Ellis Park on fast and sloppy dirt tracks, grass, and synthetic. Their margins of victory have been 5 3/4 lengths, 5 1/2 lengths, 4 1/2 lengths, and three lengths. It was great seeing Blame again, and as always walking through the outdoor and indoor stallion barns, which is like walking through the corridors of history, especially visiting the cemetery where so many immortals are buried. 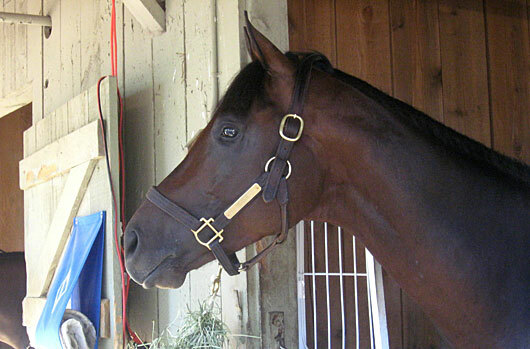 I can only hope the passage of time has softened people’s hearts and that they have come to terms with Zenyatta’s defeat and will recognize the fact that she was beaten by a very special horse, who deserves to be remembered for what he accomplished and who he was, and what he meant to one of the great establishments in racing and breeding history. 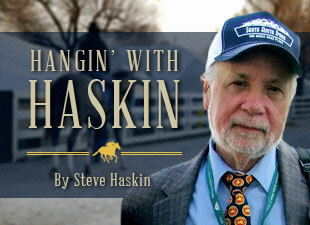 All photos are by Steve Haskin. Please ask before taking. Typical Blame with that big eye and dish face full of personality. Al Stall's daughter gives Blame a gentle pat. Stallion manager Joe Peel feeds mints to Blame. Blame poses for the camera. Still the same playful Blame. The relieving of boredom takes on many forms.